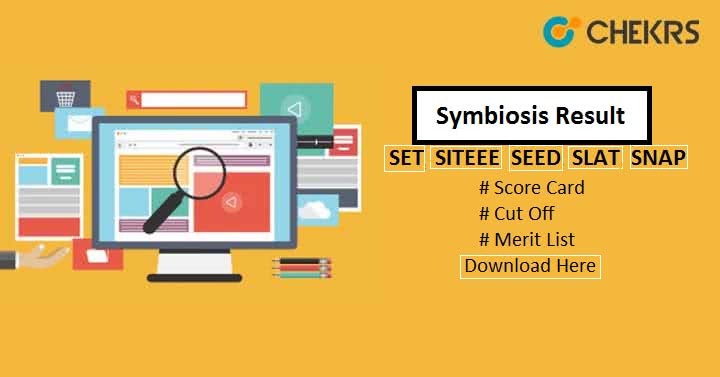 Symbiosis Result 2019 : Symbiosis Conducts Various Entrance exams for Admission in various programs. Name of Exams Are SITEEE, SNAP 2019, SET, SEED and SLAT. In this Article, we are going to cover all the entrance exam results which will be declared by Symbiosis. Latest Update: SNAP 2019 Result will be announced in the 2nd/3rd Week of January. Stay tuned for more info. Latest Update: SITEEE/ SET/ SLAT/ SEED 2019 Results are expected to be released in the 3rd/4rth week of May 2019. Most of the Symbiosis Result will be announced in the 3rd/4th week of May but SNAP Result will be declared in the month of January. Exact dates will be updated here in the table. If you are worried about the process to check your result from the official website. You can follow Our Step by step guide to Check your Symbiosis SET Result. Find and Click on the link of SNAP 2019 Result. Your Result will appear on the screen, Check it and Download it. To Check your Result Go Straight to the Official Website. Now click on the Admission. Find the Notification or Symbiosis SET Result i.e. SET/ SEED/ SITEEE/ SLAT 2019 Result. On the next page Enter all the asked details like Roll Number, Password etc. your Result will appear here. Check it and Download it. Just After the Declaration of SNAP and Symbiosis Result, Merit List will be also Prepared and released. Candidates have to download the merit list also from the Official website. The Merit list will be prepared from the Cut Off score, seat availability, Total number of appeared candidates etc. The Merit list will have the name of all the qualified students. On the basis of Merit list candidates will be called for further admission/ counselling events. A separate Waitlist will be also released to fill the vacant seats (If remain vacant). From wait list candidates will be selected for next round on the basis of WAT (Written Aptitude test), PI ( Personal Interview) and Entrance Exam’s Scorecard. Councelling Procedures are different for different Programs, But Some procedures are common for all like verifying their Documents and Seat Allotment. Before seat allotment candidates also have to fill there choices. and authority will allot seat on seat availability and Symbiosis SET Score Card. After Seat Allotment Candidates have to visit the allotted institute and complete the further admission processor.